A virus has been let loose and most of the country has been devastated.The people who made it out unscathed have to scavenge food and supplies from the dead.But there's more, ....water,gas,and electricity all gone and people have to go back to bare basics. issued by the president in order to save lives.But doing this let some reprehensible people among the populace.The MC is a sheriff and he works at trying to protect the people from the convicts. 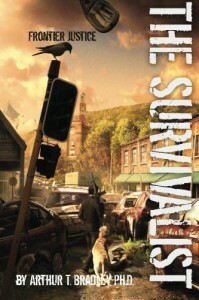 I liked this book,I thought it was written well.But hey,post-apocalyptic is one of my favorite genres.